Volunteerism is a cornerstone of the nursing profession. We start in nursing school on that path toward helping people and it carries forth throughout our careers. We offer our services to our children’s schools in the nurse clinics, for the marching band, and go into classrooms to teach what we know. At Cambridge Institute, we are no different, and in fact, we pride ourselves on the level of volunteerism that our students participate. 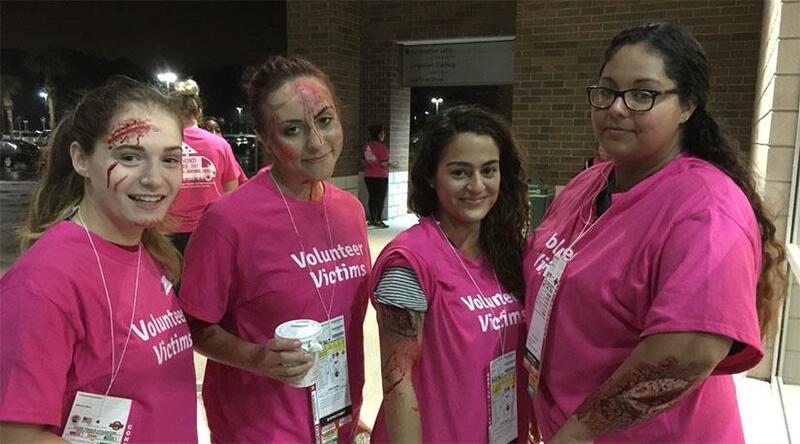 Recently, our ASN students had opportunities to volunteer as medical volunteers at several events, including the Evans High School Teach-In, the Seminole County Mass Casualty Exercise, and for the Disney Star Wars Half Marathon 2017. For the teach-in, students were taken into high school classrooms to discuss nursing as a profession and expectations of going to nursing school. During the Seminole County Mass Casualty event, students were volunteer “victims”, went through moulage, were given individual scenarios so that when they arrived at their assigned hospitals, the healthcare staff could triage the students and learn how to manage a mass amount of victims who had been exposed to a “dirty bomb”. Thirty ASN students were made up with burns, abrasions, and shrapnel in order to help simulate the “what ifs” of a mass casualty event. Recently, 18 ASN students attended to 25,000+ runners from all over the world, all participating in a half marathon. Students could be seen at the end of the race roaming with wheelchairs for runners who could not finish, as well as assisting with orthopedic and skin injury needs; icing shoulders, hips, knees, and ankles. It takes a special person to start their day at 4:30am and work in the blazing Florida sun, but the learning opportunities and the ability to help is very rewarding. At Cambridge, we are proud of our investment in the local community and look for opportunities to participate in community-based events. Look for our students at the upcoming The Promise Walk for Preeclampsia where they will be doing vital signs and checking blood pressures of pregnant women in Central Florida, as well as assisting Orange and Seminole County Schools in their school readiness exams.